Homes with Blue Bathrooms Sell Higher than Expected! Homes with blue bathrooms, often found in hues of powder blue or light periwinkle, sold for $5,440 more than expected, the highest sales premium of all colors analyzed. Walls painted in other cool, natural tones like pale gray or oatmeal were also present in top-performing listings. 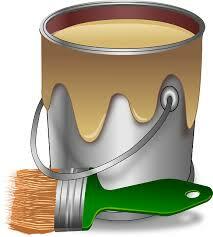 For all you need to know about paint type, paint sheen, and more, click on Paint Types and More. For-sale listings with cool, neutral wall colors sell for more money, according to Zillow analysis; homes with white, yellow or red wall colors can sell for less than expected. Zillow's 2017 Paint Color Analysis looked at more than 32,000 photos from sold homes around the country to see how certain paint colors impacted their sale price on average, when compared to similar homes with white walls. A home's exterior color may also have an impact on its sale price. Homes painted in "greige," a mix of light gray and beige, sold for $3,496 more than similar homes painted in a medium brown or with tan stucco. For a pop of color, homes with front doors painted in shades of dark navy blue to slate gray sold for $1,514 more. Some colors may actually deter buyers. Homes with darker, more style-specific walls like terracotta dining rooms sold for $2,031 less than expected. However, a lack of color may have the biggest negative impact as homes with white bathrooms sold for an average of $4,035 below similar homes. "Color can be a powerful tool for attracting buyers to a home, especially in listing photos and videos," says Svenja Gudell, Zillow chief economist. "Painting walls in fresh, natural-looking colors, particularly in shades of blue and pale gray not only make a home feel larger, but also are neutral enough to help future buyers envision themselves living in the space. Incorporating light blue in kitchens and bathrooms may pay off especially well as the color complements white countertops and cabinets, a growing trend in both rooms." Selecting the right paint color is one of many factors that may affect why a home sells faster or for more money. Walls painted in cool neutrals like blue or gray have broad appeal and may be signals that the home is well cared for or has other desirable features. Sellers can also consult Zillow's Owners Dashboard to see in real time how their listing is performing compared to similar ones on the market.